Experience San Francisco by bicycle! In less than 3 hours, cross the Golden Gate Bridge, ride down to seaside town Sausalito, and cross the San Francisco Bay via ferry to return back to the city. 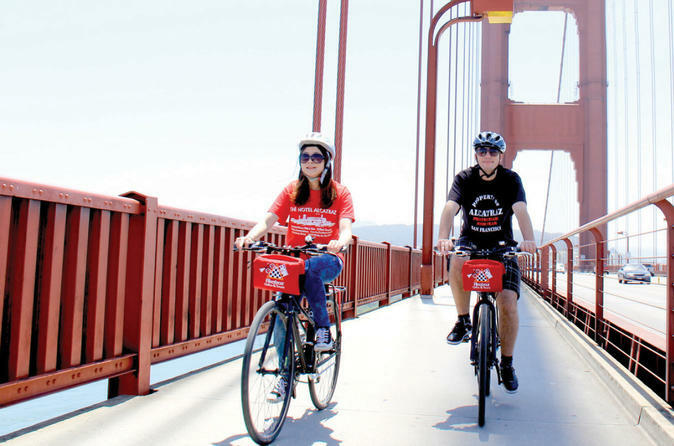 Discover San Francisco on a bicycle tour across the Golden Gate Bridge. Travel from Fisherman's Wharf and follow an expert guide to the bridge, feeling the freedom and wind in your face as you cruise across the bay, arriving in Sausalito to enjoy the beautiful waterfront. Meet your expert cycling guide at Fisherman's Wharf and travel along the waterfront, riding past a number of historic landmarks in the city to reach the Golden Gate Bridge. Once you arrive, coast across, enjoying the marvelous views of the bay all around you. Reach the other side and arrive in Sausalito, a gorgeous town by the water. Enjoy your time exploring before you choose to either ride back across the bridge or catch the ferry back to San Francisco.